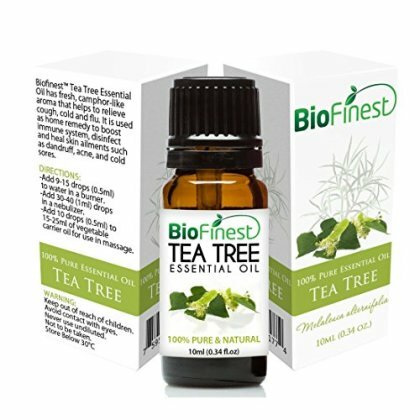 PREMIUM QUALITY Tea Tree OIL: 100% Pure, Natural, Therapeutic Grade. Steam Distillation of fresh Australia Tea Tree leaves. Non-Toxin, No Additives, No Fillers, Unfiltered and Undiluted. Vegan certified, paraben free and cruelty free. CONVENIENT 10ML AMBER BOTTLE + TRAVEL PACK + USER GUIDE: Comes with a high quality packaging for Your Convenience when dispensing and a FREE GUIDE of uses & benefits. No Leakage or Dripping. Best value for your money! WORKS WONDERS AS A NATURAL ANTISEPTIC - Great to have in your first aid kit. Tea tree oil is an essential oil that is soothing, detoxifying and cleansing for the feet, and it is very effective in soothing sore, tired feet after a long day. Because it has antifungal properties, it also helps to prevent and eliminate athlete's foot when it is used regularly as part of foot massages. It only takes a few drops of tea tree oil for it to be effective.